Data presentation is about more than making pretty charts. 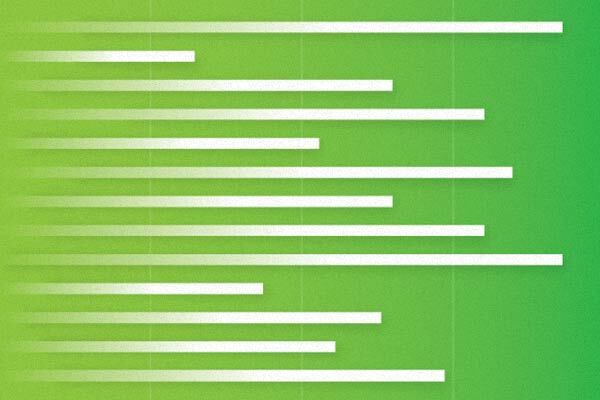 Katy shares tips for making sure your next project's data is accurate and useful to users. I came to web development after spending close to 10 years working as a planner in state, city, and regional governments, where I spent most of my time working with data—collecting it, analyzing it, and using it to create reports, charts, and maps. It was a skill set I thought, after my transition to web development, that I wouldn't be using much. I was wrong. Since becoming a developer at Sparkbox, I've contributed to two projects that involved the analysis and presentation of data. For both of these projects, the State of Open Source Security site for Snyk and the 2018 Design Systems Survey site, which was based on data collected by our team here at Sparkbox, my background helped us to create sites that provide useful information and look amazing. With both the Snyk and the Design Systems Survey sites, one of the first things I did once we had a draft of the site content, was go through and add a one-sentence description of each proposed chart. This way, we were able to ensure that the conclusions we were making were actually supported by the data, and were able to see how the data fit into the overall story we were trying to tell. Sometimes this helpful work resulted in changes to how we were presenting the data and sometimes in changes to the conclusions we were making. For example, in one of the early versions of the Design System Survey site we included a headline about successful design systems being maintained by internal teams. But using the one-sentence description method, we were able to see that the data did not support the initial conclusion we were proposing. The data said nothing about about whether or not the teams that maintain the design system were internal. It’s worth noting here that sometimes the story you or your client wants to tell is not the story the data is telling. Alberto Cairo, who holds the Knight Chair in Visual Journalism at the School of Communication at the University of Miami, wrote in his book “The Truthful Art” that a good visualization, among other things, is “presented in an attractive manner, but always remembering that honesty, clarity, and depth must come first.” In general, it takes being conscious of how you are presenting your data and making sure that you are honest both with yourself and your audience about how you have obtained, processed, presented, and framed that data. Sometimes this means adding a section that describes your methodology or a sentence that clarifies how you are using or manipulating the data. Sometimes it can mean adding footnotes, additional chart labels, or even a separate document. The goal is to provide as much information as necessary so your audience can understand where your data comes from and how you have used it. Not only is this just good practice, it also goes a long way toward developing a sense of trust between you and your audience, which is essential if you want the data you are presenting to be taken seriously. This is why, on both sites I’m discussing in this post, we were careful to be very clear about where our data came from and how, if at all, it had been manipulated. On the Design Systems Survey site in particular, we were very conscious of how we were limiting our sample size based on how respondents answered particular questions. We described this in the text and also added the sample size to each chart label so readers could clearly see how many responses we were presenting for each question. “Your challenge as an author of data products,” wrote Zach and Chris Gemignani in “Data Fluency,” “is to build a bridge of understanding between your data and the intended audience.” This is not an easy thing to do, and you will not always be successful, but putting in the effort to understand your audience and then thinking about how best to build that bridge will always be worth it. This comes back around to my first point: thinking about the story your data is telling. There are many ways to summarize and present data, and sometimes it take some trial and error to figure out which will be most interesting or compelling for your audience. The balance is finding the method that works best but also does not oversimplify. One great way to work through this is to get input from people who may be less familiar with the data, which we did to to bring clarity to the Design Systems Survey site’s stacked bar charts. This aim toward simplification was also one of the main considerations with the Snyk site and is how we ended up representing some of the data in callout boxes instead of charts. 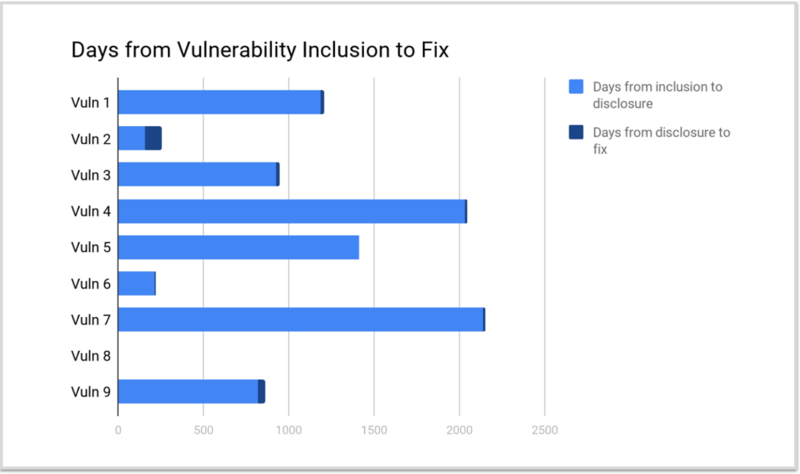 In the section on Discovering Vulnerabilities, we originally had a chart that showed the number of days it took from the inclusion of a vulnerability to when the vulnerability was addressed for the nine npm packages whose vulnerabilities had affected the most applications. As you can see below, the chart was difficult to read. We figured out that the most important information wasn’t necessarily the number of days it took to address a vulnerability for these nine packages, but rather the median amount of time—in years, instead of days—that it takes for a vulnerability to be addressed. This information was much more clearly presented as a data callout in the final site rather than the chart in the original draft. As Edward Tufte wrote in the first sentence of his seminal work on data graphics “The Visual Display of Quantitative Information,” “Excellence in statistical graphics consists of complex ideas communicated with clarity, precision, and efficiency.” The idea is to present quantitative data—-numbers—in a way that is honest and easily understood. It sounds easy, but in reality there is a lot to consider. I titled this article “Data Presentation Basics for Development Teams” because I want everyone to understand that the work of presenting data belongs to the whole team—project managers, content strategists, UX/UI professionals, designers, developers, and anyone else involved in the process. In order to create a successful data presentation, it takes the entire team working together from the very beginning of the process. While I hope you find the above tips useful, I've barely scratched the surface of all that is involved in creating good, attractive, and effective data presentations. I've put together below a list of books, websites, and videos to help you dive in further. I can't wait to see what you create! Learn Bryan’s favorite tools and practices for exceptional interactive design. Read about them in Communication Arts Magazine. Over the past year, we've been documenting our journey and focus on scaling design. In our culminating post, Jeremy shares what's worked and what hasn't, and lessons learned. Jeremy explores how we create great designs while proactively setting design expectations.